In the early 1990’s I made a series of paintings of the Bulls at Point Conception for an exhibition in Los Angeles. I wrote about them back then (essay included below). Over the last couple of decades I have gotten to know another great cattle ranch and piece of California that has not been ruined by development: Rancho San Julian. Rancho San Julian is just inland from and very different than the great wind- swept coastal planes of Pt. Conception. San Julian is 14,000 acres of hills and valleys, steep arroyos, pastures, grasslands and oaks that surround a beautiful old main house and ranch buildings. My family and I have attended memorable gatherings there with the descendants of the original family who still own and manage this working ranch. They now raise organic beef, vegetables and lavender. I have come to love the intimacy and subtle but wild nature of the landscape and the family. When a Russian collector asked me if I would paint 3 bulls for him it was just the excuse I needed to start painting at San Julian. You cannot see the ocean from there, but you can feel that it is close by. Below is an article I wrote about the Bull paintings at Point Conception. This article was published in Santa Barbara Magazine in Fall 1996. This is one of eleven paintings of bulls I exhibited at the Tatistcheff Gallery in Santa Monica in May of 1992. The night of the opening for the exhibition riots broke out in L.A. I was not amused at the irony in timing: that riots over police (bulls in slang) during the month of tauras (the bull) would ruin my exhibition by keeping people frightened and in their homes. I didn't plan this series of paintings. They evolved unexpectedly but naturally, while I was painting at Point Conception. Point Conception is the westernmost point of the continental United States. Due north is Alaska. From the north, the cold Japanese current follows the coast down until it reaches Conception and then is deflected straight out to sea. You can see it clearly in infra­red satellite photos. The temperature differentials on either side of the point causes violent and unpredictable weather and makes this one of the most dangerous navigational spots in the world. Point Conception is also the natural dividing point between Northern and Southern California. Different flora and fauna grow on either side of the point. The northern side is rocky, cold, and often forbidding. The Southern California side is usually much more gentle, sandy, warm, and inviting. About 200 yards off the north side of the point, an abalone diver was swallowed and spit up by a white shark. The diver lived but it took luck and hundreds of stitches to hold him together. I surfed close to that spot once at "Perch Rock" and I didn't like the feeling I had while sitting out there in the murky green water. The sounds at the point are wild and ancient like the landscape is: the fog horn (now replaced by radar), the howling wind, the crashing waves, the bulls bawling and banging their heads together. When I first started painting at Point Conception I only thought about how funny it was to have these big bulls, symbols of fertility, at a place named Conception. Then I started to pay serious attention to the bulls. Being around them without being protected by fences was intimidating. I started to talk to cowboys and cattlemen about bulls. Sometimes it was hard to separate the "bull" from the truth, but I learned that not only could a 2,000 pound brahma bull jump a 6' fence, he could do it from a standstill. The bulls were all around me in the fields as I worked and I started painting them, at first in the distance, like big rocks, then, gradually, they came to dominate my pictures in size and content. I tried to see these bulls individually just as I have tried over the years to paint the landscape as it is—not as it could be. 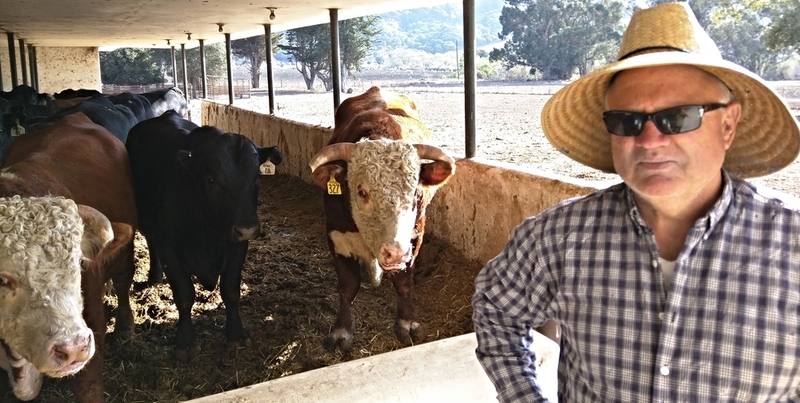 UCSB Zoology Professor D. Davenport , in a series of lectures on "The Animal in Primitive and Ancient Art," described bulls as "agile, fierce, shy, and temperamental." Davenport also described two different attitudes expressed towards animals in art. The ancient and non­western view is that there is little difference between animals and man, "both are inside the circle of life." Western art often makes animals that look like humans, and "that is often insulting to the animals," said Davenport. As far back as we know bulls have been a symbol of fertility and initiation. Young bulls were sacrificed to Dionysus. Zeus took on the form of a white bull to seduce Europa. Bulls have been strong symbols of fertility and initiation for me: my first son was born when I first started to paint them, and my father died as I was completing this series.